There’s been an awful lot going on recently in the world of golf – so much so that it’s difficult to know where to start this week’s musings. Mel chose not to name and shame the company, probably fearing jeopardising any deals some of the women players may have managed to negotiate with the big multi-nationals. That’s a real pity. This company should be named and shamed and when I replace my aging set of clubs this year I certainly do not wish to inadvertently support a company that could utter such a crass statement. When I find out the culprit, I shall certainly name them in this blog; and if that doesn’t terrify them, it should…….!! I have felt for a while that the equality movement in golf is gathering pace from the ground up but that from the top down it is found woefully wanting. 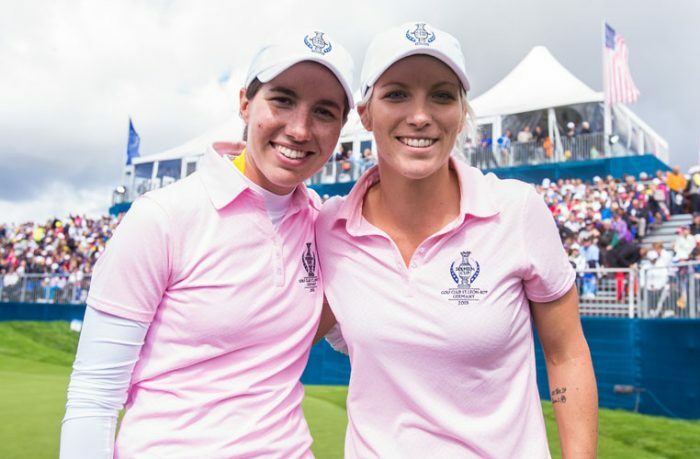 Gary Player, ever creative and provocative, has suggested in an interview with the Ladies’ European Tour that he would like to see the male professionals donate “a lousy 1%” of their winnings to women’s golf for the general good health of the game. Nice idea, Gary, but can you really see it happening? Mind you, that would mean that Adam Scott and Justin Rose, having just surpassed the $50 million dollar mark in their PGATOUR earnings alone, would jointly contribute $1 million to the women’s game. Hmmm, hope this latest Player idea doesn’t take decades to catch on like his fitness craziness did. But then, Gary always was ahead of his time. We are now into February and the new FFS Rules of Golf (faster, fairer, simpler, of course) are in the news again. Last week Haotong Li of China was penalised two shots because his caddy was deemed to have been standing behind him as he began to line up his putt on the final green. He tumbled down the leaderboard to 12th spot. This week Denny McCarthy was penalised in Phoenix under the same rule but the penalty was rescinded after endless scrutiny of the video action by officials. I thought that INTENT was a big thing in this game of ours? In neither case was there the slightest intent to gain an advantage. Slightly ironic, isn’t it that a rule change designed predominantly to stop female pros from using their caddies to help their alignment has caused mayhem on the men’s tours and slowed play down even further as a result? The USGA and R&A have acknowledged the flaws in the interpretation and implementation of the rule and have been swift to issue further clarification. I do wonder, however, just how long they will turn a blind eye to the pace of play rules – or does it not count when Bryson DeChambeau takes well over a minute on three different shots when coming down the stretch to win in Dubai? On a final note, huge congratulations to a longtime friend of mine, Marta Figueras Dotti, about whom I have penned a few words on other occasions. Marta, from Madrid, is the chairman of the Ladies’ European Tour and has been honoured with the gold medal by the Madrid Golf Association as they celebrate their 50th year. At the celebration dinner she was introduced to the great and the good of golf in Spain as “the first Spanish player to compete on the Ladies European Tour and the LPGA, with victories on both tours, who led and inspired all the Spanish players that are now in competition and who is now chariman of the Ladies European Tour.” In reality, to list Marta’s achievements in the global game would take an entire blog of its own but her influence and inspiration have touched many and this honour is thoroughly deserved. It also means that we can share a lovely, celebratory bottle of Rioja when next we meet. Gold shirt for the gold medal recipient. 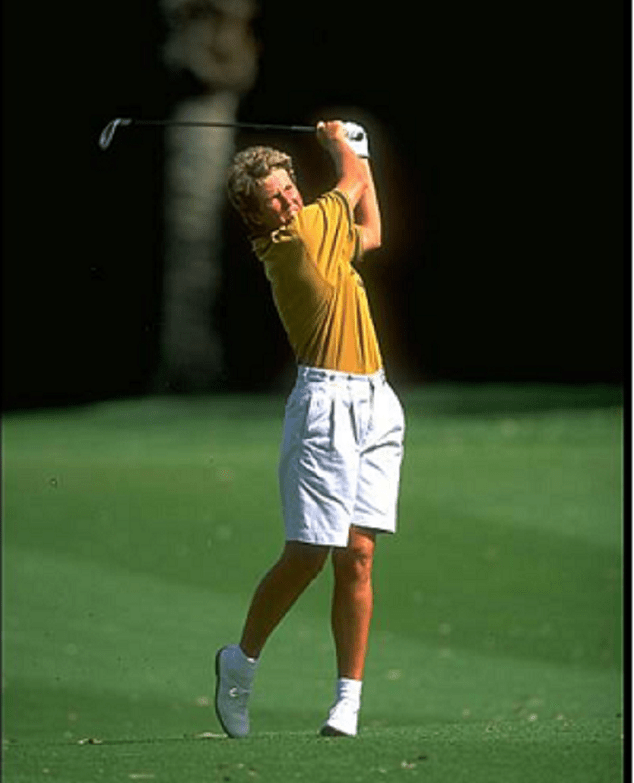 Marta in her golfing heyday. I did go to the gym – I know, I know, the heat must be addling my brain cell – for my second session of Pilates and we were using those big, squidgy exercise balls, just to make things more entertaining. If I have a core, it’s being given a rude awakening and a bit of a battering and I’m looking forward to a much improved golf swing and at least 20 yards on my drives when I get home. Either that or it’ll be all I can do to deal the cards at bridge. Playing in the midday sun at Erinvale but not a mad dog nor an Englishman in sight! That’s another thing about the heat – fat fingers, which is not what a typist with big hands and a small keyboard wants. We went hiking the other day, up behind the La Motte vineyard, leaving the air-conditioned cool and calm of the elegant tasting rooms behind. It wasn’t a long hike, just a couple of hours but it was at midday (!) and there wasn’t much shade as we trekked past pristine rows of sauvignon blanc, merlot, shiraz, chardonnay all growing away under the Wemmershoek mountain range. By the end, my fingers had swollen noticeably but I’m reliably informed that that’s because of the increased blood flow to the peripheries in an attempt to keep me cool. 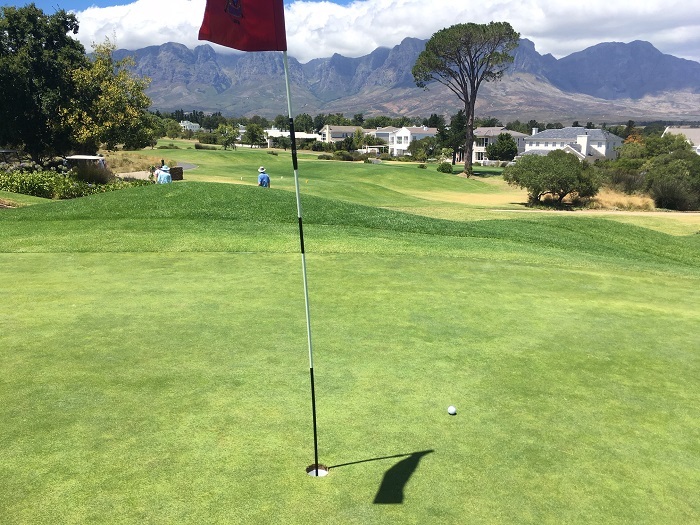 Our first round of golf in South Africa was also at midday but we were in buggies – never thought I’d be so glad of one of the condoms of golf, as Dai called them – and there was a proper wind, two to three clubs, to keep things cool. 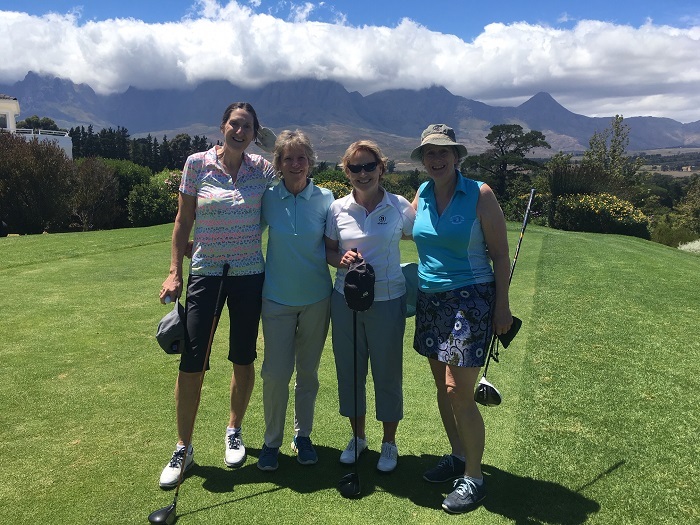 Thanks to Rae Hast, who teaches there and looks after the club dogs Ash and Belle (see the featured pic at the top), we played at Erinvale in its picturesque setting with views of the Hottentots Holland mountains, all the way down to False Bay and Cape Point, which we visitors thought was Table Mountain. That’s a bit further round – as we geographers say – and is a challenge for another day. I was lucky enough to play with Rae and all three professionals claimed to be very rusty. It barely showed and even with my shots I had to work hard to hold my own, as you’d expect. 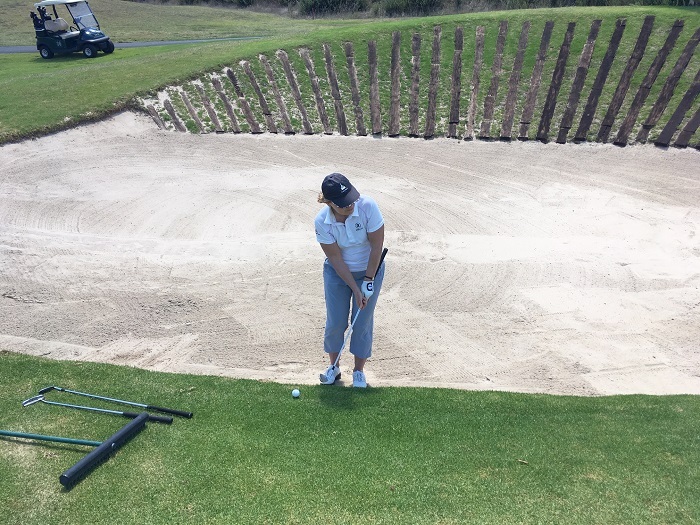 Mind you, after drawing a veil over my first attempt off the fairway with my 5-wood – my partner’s heart must have sunk – I did hit a lot of good shots off the broad-bladed kikuyu grass and even managed some respectable pitches off the unfamiliar grass. I’ll spare you my attempted close-up of the kikuyu because the picture editor is reaching the limits of her patience when it comes to my illustrations. My partner Rae in elegant action in a beautiful setting. We won the match by 1 hole. Gillian worked her magic and got up and down from here…. 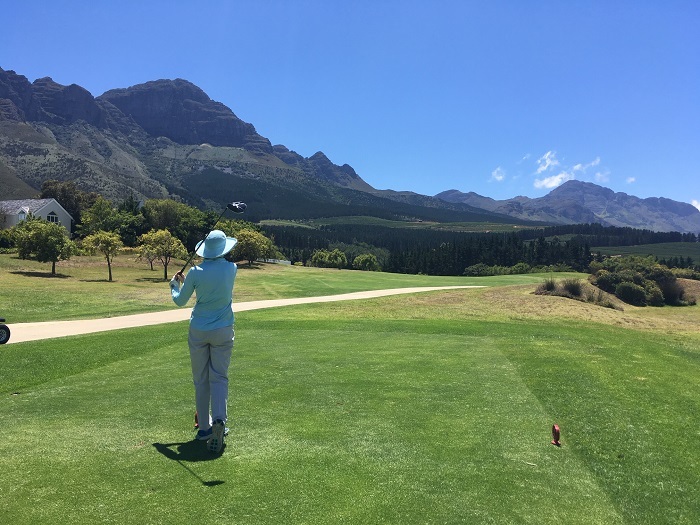 Brian, who is not a golfer but had been at a friend’s wedding reception at Erinvale years ago, enjoyed watching the proper players in the group and loved the walk, especially the hilly back nine, which is the one we played first. You don’t need to be a golfer to enjoy this place and it’s sometimes hard to concentrate on the golf rather than the views. Gary Player designed the course, which opened in 1995 (just a few years after Whittington, which was founded in 1886) and has hosted top tournaments both amateur and professional ever since. The great thing is that it’s enjoyably playable by us lesser mortals too and the light and airy clubhouse – not ostentatious – was a comfortable, welcoming place to be. It’s funny what the locals take for granted. 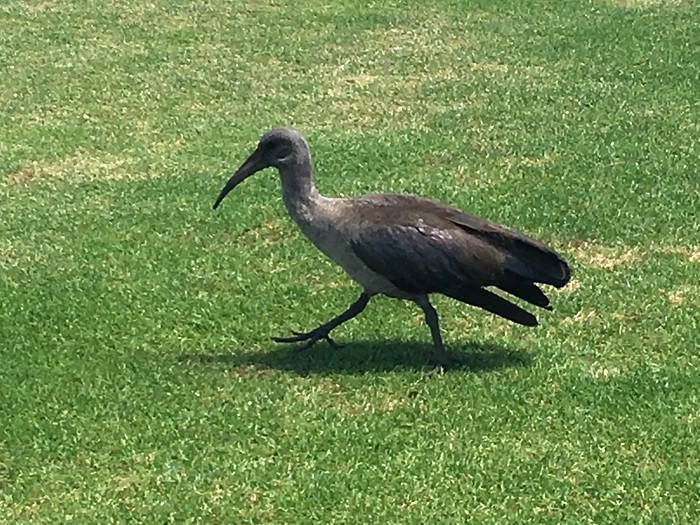 There was a bird with a thin, curved beak, a bit like a curlew’s to my eyes, pecking away on one of the fairways and I was keen to take its picture. “Oh, that’s a boring old bird,” Rae said, “it’s got a loud squawk and sits on the roof.” It also makes house calls, as we discovered when we found two of them pottering around in the garden, beside our swimming pool. Howdy-do to the old hadidah. And, dull or not, no bird that is called a hadidah can ever be called boring. Apparently it’s also a word that can be applied to this column and its assorted inconsequential meanderings. Perfect. Hadidah. Until the next time.